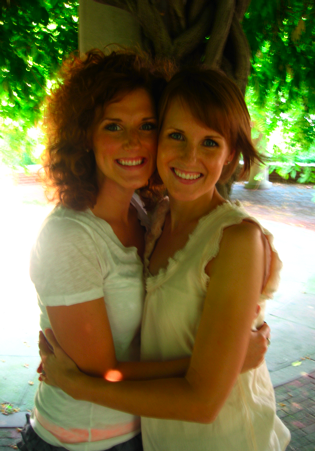 My sister, Corinne, is one of the most amazing and truly beautiful women I have ever known…in every way. Compassionate, wise, loyal, truth-speaking, gourmet-food-loving, hilarious, full of integrity, witty, fashionable, humble, following after God’s heart, sings like an angel, gorgeous. This only scratches the surface of all Corinne McGowan is. She arrived on Sunday for a few days of girl time before the full-fledged family Thanksgiving activities begin. Can I just say I LOVE spending time with my sister?! We spent the whole day together Monday – talking, laughing, playing with Eliana, enjoying delicious food and cooking. It was perfect! For weeks, she had been telling me of these veggie empanadas her friend, Julie Berger, had made. So adorned in aprons and with cooking gear in hand, we set to make our own batch of these tasty fried treats. In the end, the kitchen was destroyed, our aprons covered in flour and our cheeks sore from laughing for hours. But MY, were these empanadas delicious! Savory vegetable filling wrapped in the lightest, crispy crust. It certainly won’t be the last time we slave away in the kitchen to make these. Served with spicy quacamole and sour cream, they were simply sublime. So get your finest cooking attire on, head to your local grocery and get busy making your own batch of these scrumptious bundles of goodness! You won’t be disappointed. Patience!!! So I must confess that I haven’t been very good at keeping up with the blogs recently, so I just checked your for the first time in way too long, but I have to say CONGRATULATIONS!!!! You have had a very exciting few months – new pregnancy, finishing a half marathon, growing and ADORABLE little girl. What a blessed time of life. Much love to you! !